The number of containers handled in the port of Rotterdam continues to grow. In the first nine months of 2017, the throughput of containers increased by 10.1 percent compared to the corresponding period in 2016, to a total of 10.2 million units (TEU). The port’s total throughput in that same period increased by 2 percent. In addition to containers, the key contributors to this overall growth were the agribulk and breakbulk segments. The port recorded a drop in the throughput of liquid bulk like mineral oil products. A total of 351.5 million tonnes was handled in the period until the end of September. The volume of liquid bulk put through the port decreased by 4.2 percent, to a total of 161.5 million tonnes. Even though higher production rates in the refining sector resulted in 3.5 percent more crude oil being handled in Rotterdam’s port area, the third quarter saw a further decrease in the mineral oil products segment as a whole. This was primarily caused by a drop in the import and export of fuel oil. The main country of origin for fuel oil is Russia. A recent increase in Russian export duties has led to lower production levels and, as a result, declining export volumes. The volume of LNG put through Rotterdam remained more or less the same at 1.3 million tonnes (3 percent lower than the same period in 2016). The throughput of dry bulk rose by 1.4 percent to 61.1 million tonnes. The port saw a strong increase in the agribulk category (cereals/animal feed) of 14.7 percent compared to last year (to a total of 8.8 million tonnes). This increase can mainly be attributed to the stepped-up production of biofuels in connection with the relaunch of a production facility for these fuels. There was modest growth in the throughput of iron ore and scrap (0.7 percent, to a total of 23.4 million tonnes) thanks to the increased export of scrap. The volume of coal handled in the port fell by 2.6 percent – due to, among other things, the closure of two coal-fired power plants on Maasvlakte. The throughput of containers in the first nine months of 2017 increased by 10.1% in TEU (standard capacity unit) and 11.7% in tonnes. A total of 10.2 million TEU was handled in the port, corresponding to a total of 105.9 million tonnes. This is mainly explained by the stronger increase in the number of full containers handled in the port than in the number of empty containers. In Q3, the port saw a 3.1-percent increase in the containers segment compared to the second quarter of 2017. This puts total growth even further past the record level achieved in Q2. 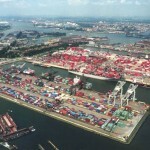 At the very least, Rotterdam’s market share in the Hamburg-Le Havre range is expected to remain stable at the highest level since 2001 (30.9 percent in TEU). 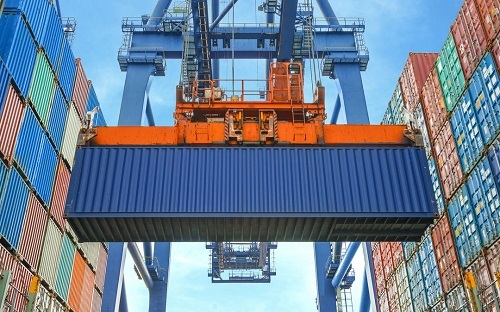 The increased throughput of containers can be attributed to a number of factors. These include solid autonomous growth in Europe combined with Rotterdam’s favourable position within the new sailing schedules recently adopted by the major alliances, increased productivity and throughput volumes at the Maasvlakte 2 terminals and Rotterdam’s strengthened appeal as a transhipment port in connection with increased vessel sizes and relay/feeder options to/from other European ports. Rotterdam saw a further growth of 6.6 percent in roll on/roll off (ro/ro) volumes in the first nine months of 2017 compared to the previous year, to a total of 17.9 million tonnes. This growth was caused by increased cargo flows to the dominant market in this category, the United Kingdom, as well as increased traffic to new markets like Portugal, Iceland and the Scandinavian countries. Other breakbulk also rose in the first three quarters of 2017, by 18.9%, as a result of the extra handling of slabs on behalf of the German steel industry – particularly in the first half of the year. This extra throughput dropped off again in the third quarter of 2017 when various steel plants in Germany became fully operational again after rounding off a period of maintenance and repairs.